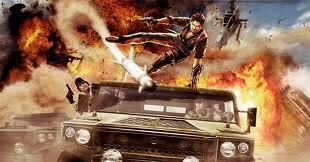 Just Cause 2 – what a game! Rico Rodriguez being as epic as ever! Thanks to Joeslife101 telling me what a great game Just Cause 2 is, I played it and within the first 5 minutes of playing it, fell in love! It has the good aspects of the original Just Cause with some upgrades with the fantastic graphics – so vivid. I must admit I did get stuck with the grappling system, it has changed dramatically from the first one plus I’m now playing on Xbox not PS2. The vehicles feel much more realistic, the island and guns feel better thought out and the Storey-line and missions are grittier and more believable. I’m not saying the first one was bad, and it wasn’t, in fact it is one of the best games I’ve played but, what a step has this game taken! You are again Rico Rodriguez, who again starts free-falling down and having ‘little’ shoot-outs with the odd enemy, sound familiar? As you go through the game you find and gather more money, vehicle and armour parts and earn chaos (by blowing stuff up). You can buy weapons, explosives and vehicles with the money. You can upgrade them with the vehicle and armour parts. The settlement or now stronghold take overs are harder due to miniguns, tanks and a lot of armed guards! The army bases are harder due to a colonel you have to kill who is better armed and protected than the previous game. This is a great game, on par with other shooters I have played plus you can drive vehicles. Back in the days of my PS2 I had many games. 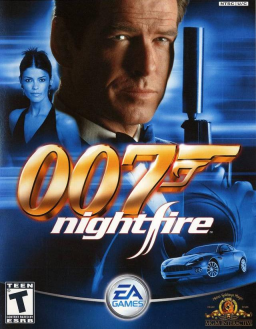 But the best of these has to be ‘007 Nightfire’. The story line has an almost CoD feel to it. You travel around the world to exotic locations, combining stealth and gadgets to complete missions. You get to drive and shoot from some of Bonds most iconic vehicles, including his Aston Martin V12 Vanquish. The story line has a lot of quite difficult missions, some where you will be stuck. But when you do get past them it feels all the better. This game is from before the days of online Multiplayer however it makes up for this with ‘bots’ which you can play against with or without others (a bit like combat training on Black ops). The weapons are fun but not so realistic, some involving lasers but it did come out in 2002 so you have to let them off! This is a great game when played with a mate or two. So dig up those dusty PS2’s and revisit an old friend!